Explanation: How far can you see? Even the faintest stars visible to the eye are merely hundreds or thousands of light-years distant, all well within our own Milky Way Galaxy. Of course, if you know where to look you can also spot the Andromeda Galaxy as a pale, fuzzy cloud, around 2.5 million light-years away. But staring toward the northern constellation Bootes on March 19th, even without binoculars or telescope you still could have witnessed a faint, brief, flash of light from a gamma-ray burst. The source of that burst has been discovered to lie over halfway across the Universe at a distance of about 7.5 billion light-years. Now holding the distinction of the most distant object that could be seen by the unaided eye and the intrinsically brightest object ever detected, the cosmic explosion is estimated to have been over 2.5 million times more luminous than the brightest known supernova. 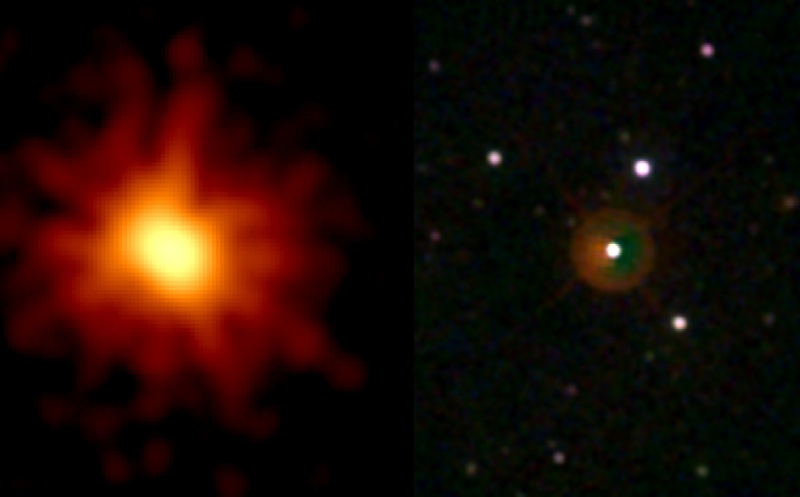 The monster burst was identified and located by the orbiting Swift satellite, enabling rapid distance measurements and follow-up observations by large ground-based telescopes. 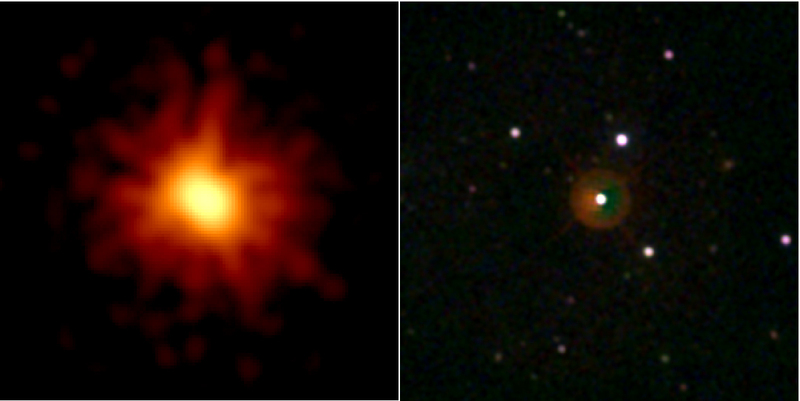 The fading afterglow of the gamma-ray burster, cataloged as GRB080319B, is shown in these two panels in X-rays (left) and ultraviolet light (right).